Two-time National Book Award nominee Melisaa Fay Greene puts a human face on the African AIDS crisis with this powerful story of one woman working to save her country's children. After losing her husband and daughter, Haregewoin Teferra, an Ethiopian woman of modest means, opened her home to some of the thousands of children in Addis Ababa who have been left as orphans. 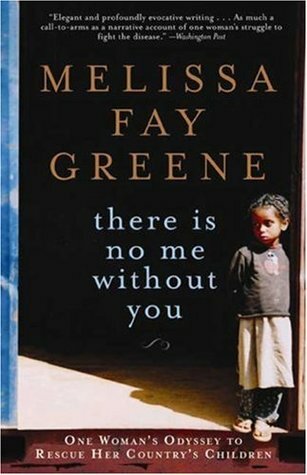 There Is No Me Without Me is the story of how Haregewoin transformed her home into an orphanage and day-care center and began facilitating adoptions to homes all over the world, written by a star of literary nonfiction who is herself an adoptive parent. At heart, it is a book about children and parents, wherever they may be, however they may find each other. I used to read more non-fiction prior to blogging. While I still love it today, I find that my attention is often drawn elsewhere. However, whenever I become interested in a topic, I almost always end up looking up books about it. Anything from famous people to notable events can catch my attention and result in an excited trip to the library. But that's not what happened with There Is No Me Without You. I've talked a little about this before on the blog, but it was mostly in terms of how I met my husband so I think it's worth mentioning in this post. After my freshman year of college, I had the opportunity spend six weeks in South Africa with a group of students from colleges all over the southeast. We spent the first three weeks at the University of KwaZulu-Natal in Durban, the largest city in the South African province of KwaZulu-Natal, meeting with and getting to know some of the students there. The second three weeks were spent in the townships volunteering in orphanages, making repairs to homes and spending time with the incredible people of that city. South Africa has one of the highest rates of HIV/AIDS in the world - a fact that was impossible to escape while we were there. There are a few things in my life that I can pinpoint and say this moment or that person or that place absolutely changed my life, the way I see the world and the person I am today. South Africa is one of them. It's been years since I was there, and I still think of it often. Hearing about a need isn't the same as seeing it with your own eyes. When something like that becomes a tangible reality? You'll never be the same. It impacted me in a way I can't even begin to put into words. You hear about HIV/AIDS, and it's a number, a statistic, a report in the news or mentioned in a speech from a person in a position of power... but those numbers are individual people with beating hearts and blood running through their veins. The numbers are so big that they're impossible to wrap your mind around, and I know the problem seems insurmountable. It's like a triage unit - where you just help those who need it most and hope that somehow, some way, the influx of wounded will eventually stop. The crisis became real to me, in a way it never had before, after seeing it firsthand. While I was at the beach last summer, I stopped in at one of my very favorite bookstores (Sundog Books) and spotted There Is No Me Without You on the shelves. The book focuses on how the HIV/AIDS crisis has impacted Ethiopia, not South Africa, but I knew I still had to take the book home with me. There Is No Me Without You is my favorite kind of non-fiction because it takes a really large topic and brings it to the personal, human level. It's a book about the HIV/AIDS crisis, yes, but it's told through a smaller lens: the story of one woman. After losing her husband and one of her daughters, Haregewoin Teferra begins opening her home to some of the thousands of children in Addis Ababa who have lost their family members to AIDS. It starts as a request from a local church for Haregewoin to care for one teenage girl... and it quickly becomes a makeshift orphanage, a place where the lost come to be loved. There are chapters throughout the book that step back and explain the big picture - the history of Ethiopia, how that contributed to its current state, theories as to the origin of HIV/AIDS, the politics of medicine and the role of pharmaceutical companies, drug patents, money and privilege. The research that went into this book is so evident in these chapters, but I appreciated that the focus was mostly on Haregewoin. I found the interjections fascinating and informative, but it's Haregewoin's story that captured my heart. She's a flawed human being - a complicated, messy woman willing to do what others won't. Her home becomes a haven for the hopeless, and she stumbles through this unexpected turn in her life in the best way she can manage. She doesn't always get it right, but does anyone? Reading about this woman gave me such an appreciation for the people who put love into action and become a powerful force for good. Haregewoin lives in a way that demonstrates how changing the world for just a handful of people matters. You don't have to right every wrong in order to alter the course of someone's life. The children brought into her care are orphans who have lost almost everyone... It is a world without adults where not having an advocate can be the difference between life and death. The author takes you into right into the heart of Ethiopia in these pages, and you don't have to hop on a plane to have your eyes opened to what this epidemic looks like firsthand. The book is really well researched, and you will probably learn about the history of HIV/AIDS. It's a little heavier on that content in the first part, which did make that section drier overall. Those chapters won't sink into your bones. It's the personal stories - the heartbreaking but hopeful stories of these survivors - that will reach down inside you and won't let you go. While the book's pacing worked for me, it's not an easy read. It is emotionally heavy and very sad, so it won't be a book that you pick up lightly. It's also not without flaws - Greene occasionally describes her subject's thoughts or emotions, putting herself a little too much into their shoes and presuming to know more than she possibly could. But it's also what makes this book so emotional and engaging. Further, she doesn't present the topic from a neutral point of view - something that may or may not bother you as you read. She has personal ties to the subject matter that aren't revealed until rather late in the book, and I think that may have contributed to the way she writes about the crisis. At the end of the day: whether or not you have any history with this subject matter, this book is worth reading. You'll learn something, yes, but you'll also be touched by the stories in these pages. I could cry just thinking about it, but I absolutely recommend There Is No Me Without You. It's hard, but it's worth it. "So how does it happen that - while most people instinctively try to save themselves and their families from a catastrophe - a few slow down, look back, and suddenly reach out to strangers? Instead of fleeing in the opposite direction, a few wade into the rising waters to try to yank the drowning onto higher land. [...] In the coming months and year, I would learn that - just as there is no blood test to identify who will jump into the fray - there is no simple biographical arc either. No resume can predict why this man or woman, at a safe remove from crisis, suddenly announces, 'This is my fight.'" I might not read a lot of non-fiction, but like you, I really like picking up books about topics that interest me! I'm so glad that you wound up enjoying this one. And I love that you shared a bit about your own experience in South Africa! this is a really interesting book & something that i might consider reading, though I'm not a big non-fiction fan. i absolutely want to go on a mission to Africa with my church and this would be a fantastic orientation to the continent before I go. I've read this it is fantastic. I have a real passion for these stories, They Call Me Dad is another fantastic read on this. Philip Cameron is the author and his site is at http://www.stellasvoice.org/they-call-me-dad/. The amazing circumstances these kids live in is unbelievable, just a real eye opening read.